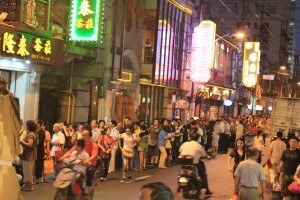 The mid-autumn festival is one of the most important annual Chinese festivals and we were in Shanghai for the event. Our guidebook told us that it was an ancient festival to celebrate, worship and watch the moon. A romantic night too, we were told, for couples. And mooncakes are an integral part of the day. Kind of like mince pies for Christmas in the U.K. or turkey on Thanksgiving in the U.S.
We set out to find out how modern day Chinese celebrate this age-old holiday. We asked everyone we could and Googled trying to make sure we weren’t going to miss a massive fireworks show or public celebration. Turns out, it’s a holiday where families and friends gather and eat mooncakes. So, we embraced the mooncakes. 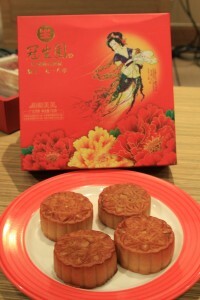 Because the tradition is to give a box of mooncakes to families, employees, and clients. They are sold in elaborate boxes and can get quite gourmet and expensive. 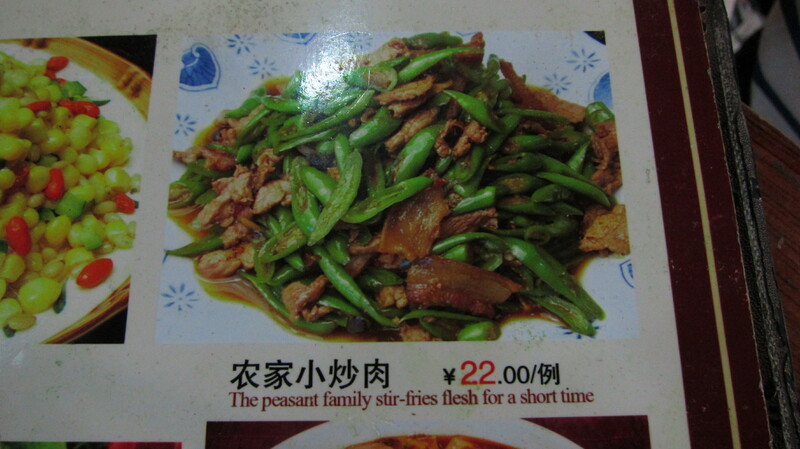 This Shanghai magazine lists the 2011 “collections” ranging from 3RMB (50 cents) for one to 388RMB (50 dollars) for six. 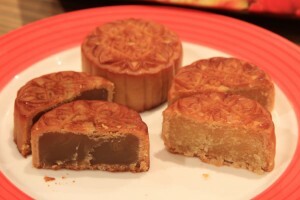 This year there was a hub-bub about the government proposal to tax gifts of mooncakes from employers. People were outraged, because it would be just enough to put many into a higher tax bracket. 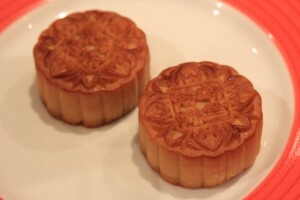 We decided to have a night where mooncakes and beer were our meal. Savory mooncakes for dinner and sweet mooncakes for desert. What could be a better experiment? A line for fresh savory mooncakes. Blocks long! 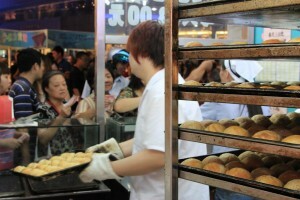 We saw a block-long line and hoped it was for freshly baked savory mooncakes. Not really sure we jumped in the line anyway. We were handsomely rewarded. These flaky meat-filled cakes were my favorites. Next we went to the market where a sales woman motioned for us to put down the fancy box of sweet mooncakes we were holding and get a different brand. Through pantomiming, which we’re now experts at, she told us they were better and cheaper. Well, that’s what we think she said. We couldn’t read what the fillings were but we guessed that they were lotus seed paste, coconut, egg yolk and sweet bean paste. I only liked the coconut one but I don’t have a big sweet tooth anyway.